I really loved this product. I have really long, thick hair, so I was a little nervous that I would have to use a lot of hair chalk for the color to show. The look I was going for was to chalk my tips and then wave it through my hair for a more "feathery" look. 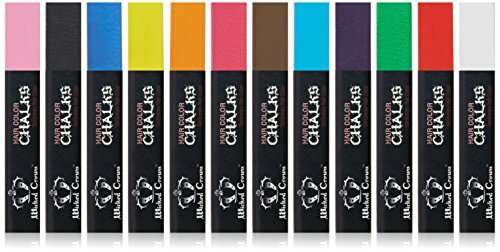 I was really impressed with this chalk because after I was done applying it and drying it, it was the perfect pop of color. Application does get a little bit messy, so I wouldn't wear anything you wouldn't want to possibly get stained (although the mess I did make I was easily able to clean up). Gloves might also make application a little less messy, especially if you are using more than one color. Quick tip: I would make sure to use hair spray or some other sealant to keep the chalk from rubbing off during the day. Lastly, while I do love this product and will use it again, it is important to note that I have blonde hair, so the color showed up really well. My dark brunette friend said she did not have as great results and had to apply the chalk rather heavily for it to be noticeable. Oh cool, this looks like fun! How long does the color stay in your hair? My daughter loves all the crazy hair colors, and this seems like an easy option! I'll have to give this a try! I also have really long thick hair and the thought of adding color is taunting. Temporary would be a good option! And I dye my hair red so we'll see if it's any match for my dyed hair! I have always wanted to try these but can never find them anywhere! I have really thick dark hair so when I dye it, it never comes out even. I am forced to leave it natural. So I would love to try these to get some color in my hair.